A unique blend of mineral salts with hemp oil and aloe vera provides 24-hour natural deodorant protection. I was super sad when kiss my face liquid rock was no longer sold anywhere after using it for over a decade. I searched and found this brand and decided to give it a try. I am so impressed with it that when it went on sale I bought a bunch of bottles. It has a nice light smell and works really well. Remember to always have clean armpits when applying any natural deodorant, that is KEY! I purchased this because itâ€™s aluminum free and doesnâ€™t contain baking soda, and it had already great reviews. Iâ€™m only rating it a three though, because it just doesnâ€™t seem to work for me. I definitely need to wash and reapply before end of day. Very nice fragrance though, and happy to have something more natural! The only natural deodorant that does the job for me. And I've tried dozens. The only natural deodorant that works for me. I love it! Great product. I love the scent of it and the texture. This deodorant works really well in winter season when I don't have an excessive sweating. Hopefully it will work the same way in summertime. Smells great and it really works. I love this deodorant. So much. I was using baking soda deodorant before, and it was staining my clothes really bad while also sadly not doing its job the best. This deodorant works fantastically! It stops me from smelling all day with no need to reapply and so far hasn't left any trace of residue! It also doesn't have any gross gunkiness like the baking soda deodorant I was using. Woohoo! Like other reviewers mentioned, it does go on wet but dries quickly. It also really doesn't smell at all like citrus to me, but it smells fresh and clean. And that's how it keeps my armpits: fresh and clean! Absolutely recommend this deodorant! It saved me (and my poor clothes!)! 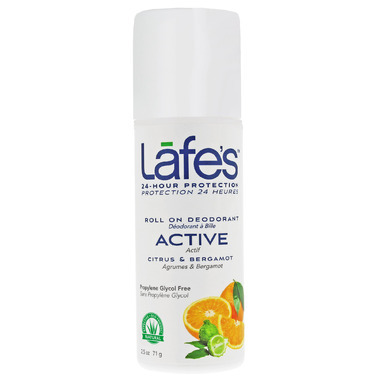 I really love Lafe's deodorants, the active one is great for my physical job! Love this deordorant! For years I've looked for a deordorant that actually works. Not untill I decided to use more green products that I stumbled onto this deordorant. Now, I buy it for my granddaughter as she loves it also. This deodorant is all I use. I tried the Himalayan salt bars but they make my skin so itchy I can't use them. So happy I found this. Both my husband and I use this deodorant, and it works great for us. It dries after application, doesn't smell strongly, and doesn't smell unpleasant during use. Smells great, but not too strong. Works better than any other deodorant I've tried and lasts through the whole day and night. I'm loving it! It smells quite lovely and it is slightly cooling and soothing on a hot day to roll this deodorant on, I also like that it doesn't leave residue on my skin or clothing! I think everybody should try it just once and see if it works for them, I thought I needed stronger stuff than this but I really don't. Thanks to whoever made this! This product is quite good! Nice subtle scent; doesn't interfere with other scents you might be wearing. I find this really quite well for odour prevention, on my regular days. It does not, however, stop underarm wetness under extreme conditions. When it is super hot, or I am going to the gym, I prefer to use an antiperspirant. Overall. perfect for everyday use. So pleased with this product. it is mild, fast and long acting and sure has kept me dry in this awful humidity. I have little success with deodorants, and am so happy to have found this product. So far I love this. No irritation or burning, even when freshly shaved. I have not tested it out on long, hot, sweaty excursions but for everyday walking around, office jobs, it works for the full 24 hours plus. I'll update, when there is another hot spell where I live. Amazing product if you're trying to get away from aluminum products. I've only used it 4 times since I bought it about 2 weeks ago. So far so good! Helps with the stink while working. Haven't tried it out for the gym yet. Works pretty well, on average days. On busier days where I have to run around the office and do more lifting it's not as good. But as it is all natural, I'm thinking perhaps I should get a second one to keep in my desk. So far the salt rock has been my go to deo: works all day long and lasts a long time. For it to work though you need to swipe it 25 times which is kinda of time consuming. That's why I decided to give Lafe's a try. Glad I did! Works great, fights odour all day long and just a little product goes a long way. Just a couple swipes and you're covered. Nice scent too. Very light and fresh. Highly recommend. I ordered this product because of the reviews, didn't work that well for me. It smells great and works pretty well for casual days. The only down side is how long it takes for the product to dry. This is a great smelling natural deodorant product which I use in combination with another product to keep odour at bay. This is the best deodorant! When I switched from antiperspirant to aluminum free deodorant I tried every natural deodorant out there and none of them worked until this one. It is not sticky, dries quickly and has a soft scent, unlike most natural brands that reek of patchouli or tea tree oil. It lasts all day and no odours. I highly recommend this for women trying to avoid aluminium. I usually have problems with natural deodorant. Most don't stand up to a day's worth of activity. This, however, has done the job well. Very pleased. Lafe's Hemp Deodorant it the only deodorant I can use, it does not cause any alergic reaction. The Well.ca service is excellent too! Other organic deodorants don't seem to do the job, but I get lasting results with Lafe's Hemp roll-on. It requires drying time but that's OK, it didn't take long getting used to it. I will never go back to a stick deodorant. I've tried a lot of natural deodorants but this works better than anything else I've tried and has a nice fresh fragrance.